From its modular modern design to its shipping container components, Olgga‘s student housing complex struck us as a pitch perfect project for prefab friday. The French architecture firm designed the complex to be constructed from 100 repurposed shipping containers. Talk about putting your students in a box! The project was developed for a contest promoted by the Centre régional des œuvres universitaires et scolaires (CROUS) of Haute Normandie (an administrator of student assistance in France. The contest challenged architects to explore creative designs for student housing complexes that utilize shipping containers, with the aim of creating the first such structure in the country. Olgga came in second place with their design, which comprises 2,900 square meters and would cost around 4.5 million euros. 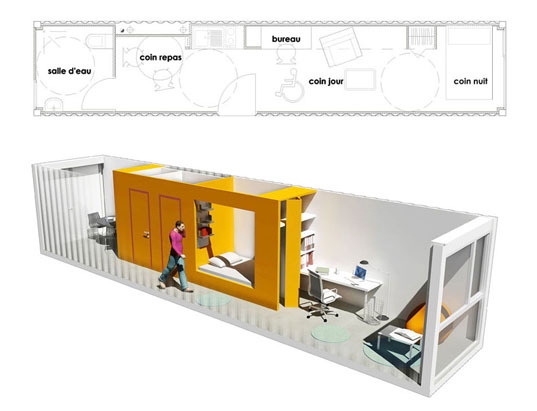 Each container is a room for one student, complete with a study area, bathroom, and living room. For more amazing shipping container abodes, check out Flavorwire’s assortment here. @The Campus TV: perhaps you could spend less time on pointlessly converting units and more time on thinking how renting works. Each apartment, being 29 square meters, would cost 45 kEUR. If this complex would survive just fifteen years (pretty short), you would need to gain 3 kEUR per apartment per year, or 250 EUR per apartment per month. For ten years: EUR 375 per month. Seeing how some student apartments of 17 square meters in Utrecht can already cost over 250 EUR per month in net rent, I think this is a very viable solution. This isn't an innovation, because containers are used for years as student housing, here in Groningen. 1 square metre = 10.76 square feet 1 Euro = $ 1.40 on the date of this post 02/05/10 2,900 sq. metres = 31,204 sq.ft 4.5 M Euro = $ 6.3 M Cost = $ 202 per square foot. The whole point of using recycled shipping containers should be to make it a more cost & time effective effective SOLUTION. "green" will not be accepted by the mass market if it continues to be a niche in architecture that does not meet economic viability - which is exactly how the general public perceives the "green" movement. We are in the construction business and have been working on cost effective design incorporating containers so this is not just an empty criticism not grounded in experience. A project like this should cost $ 100/foot including developer/contractor profit, site work etc excluding land. From its modular modern design to its shipping container components, Olgga's student housing complex struck us as a pitch perfect project for prefab friday. 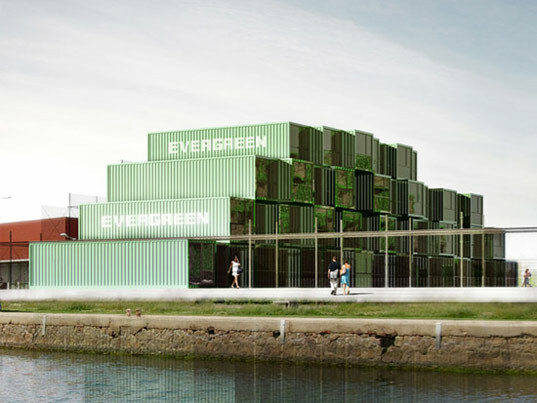 The French architecture firm designed the complex to be constructed from 100 repurposed shipping containers. Talk about putting your students in a box!